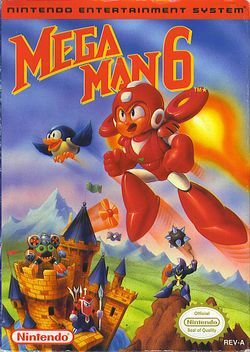 Mega Man 6 is the sixth Mega Man game in the series, and the last Mega Man game on the NES. The NES version was released only in Japan and the U.S. In 1993 the game was re-released for the PlayStation exclusively in Japan. Years later, in 2004 the game returned to sixth generation consoles bundled in Mega Man Anniversary Collection. In 2007 it was released in Japan for mobile devices. In 2012 it was released for the Nintendo 3DS Virtual Console via the Nintendo eShop. In 2014, the Nintendo eShop release was made available for the Wii U Virtual Console.